Mary Albert, Sarah Kiefer, Nikole Williams, and Heather Michelle in Merciful Father. Photo by Gerry Goodstein. 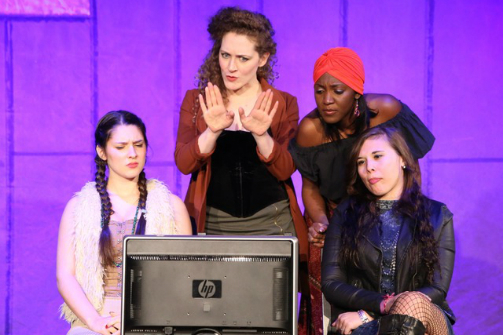 BOTTOM LINE: A provocative new take on Sholem Asch’s Yiddish play God of Vengeance that tackles issues in religion and the purity of love. Atar Hadari updates Sholem Asch’s scandalous Yiddish play God of Vengeance, which opened on Broadway in 1923 and featured the first ever lesbian kiss on stage. Hatari's version is set in Manchester, England, as the owner of a brothel commissions the creation of a Torah scroll in order for his daughter Rachel (Lauren Capkanis) to marry a respectable husband. However it turns out that Rachel has already fallen in love with Manke (Nikole Williams), one of the working girls. This lesbian relationship meets with disappointment and disapproval from Rachel's parents, which eventually leads to Rachel’s death, forcing the family to rethink the concepts of indecency and morality. The production features a vaudeville-styled pre-show to set the tone. Actors Richard Gunn and Jonathan Ellers are a wildly entertaining duo, performing a series of hilarious magic tricks, or magic mishaps to be more precise. The final moments of the introductory skit reveals a Torah scroll, the focal prop of the entire play. Merciful Father itself attempts to continue the vaudeville style from the pre-show, especially in the more lighthearted first half of play, which features canned laughter to induce a melodramatic, sitcom-esque aesthetic. This effect is unfortunately somewhat distracting and doesn’t help the audience to follow the plot. Set designer Samuel Vawter and costume designer Brenna McShane do a good job of enhancing the production's aesthetics with minimum materials while generating convincing effects. Merciful Father surely taps into some issues that are sadly still relevant, especially when it comes to religion. However, Hadari's script calls for some clarity, and the production could be trimmed of some unnecessary fluff. But there is certainly value in this play, and the terrific acting ensemble all deliver their parts with conviction. Merciful Father is by Atar Hadari, and directed by James Bosley. Set design is by Samuel Vawter. Costume Design is by Brenna McShane. Lighting Design is by Duane Pagano. Sound Design is by David Margolin Lawson. Stage Manager is Elizabeth Ramsay. Cast is Mary Albert, Matt Antar, Elizabeth A. Bell, Lauren Capkanis, Bill Christ, Jonathan Ellers, Richard Grunn, Sarah Kiefer, Heather Michelle, and Nikole Williams.